Kills today's fleas and prevents tomorrow's fleas from growing up to bite. 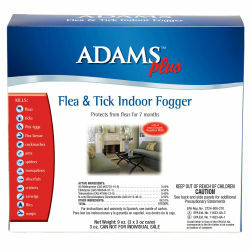 It effectively breaks the flea life cycle and inhibits flea reinfestation for up to 7 months. Kills adult fleas, hatching flea eggs, flea larvae, ticks, cockroaches, ants, spiders, mosquitoes, silverfish, and many other insects. Non-staining, easy to apply.